Even before the cardiac patient enters the emergency or operating room, there are many new technologies being developed to aid in the resuscitation of an individual who has suffered from cardiovascular failure. Such devices range from improvements of existing tools (e.g., the automated application of cardiopulmonary resuscitation or CPR) to novel mechanisms that accomplish improved outcomes (e.g., an impedance threshold valve). Furthermore, automated external defibrillators have become commonplace in the United States, with such units purchased for use in schools, health clubs, emergency vehicles, shopping malls, and even homes. A number of active compression-decompression devices have been developed (Fig. 1), and numerous clinical trials have suggested improved short-term survival in patients with an out-of-hospital cardiac arrest (1-7). In addition, in one study it was reported that active compression-decompression CPR performed during advanced life support significantly improved long-term survival rates among patients who had cardiac arrest outside the hospital (6). Furthermore, when such active compression-decompression devices were used in combination with inspiratory impedance threshold devices (Fig. 2), there was an even greater positive outcome (8,9). More specifically, it was described that the use of an active compression-decompression device combined with an inspiratory impedance threshold device improved 1-h and 24-h survival in 103 patients who received that form of CPR vs 107 who received standard CPR (10). Fig. 3. 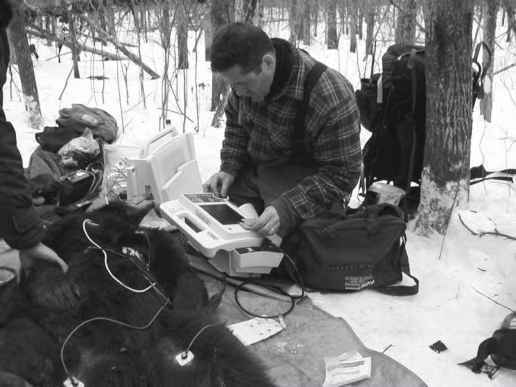 A LIFEPAK 12 internal defibrillator (Medtronic, Inc., Minneapolis, MN) used externally (outside) on an overwintering black bear. In this case, Dr. Tim Laske is using the system to monitor a 12-lead electrocardiogram (ECG) via its connection to surface electrodes. 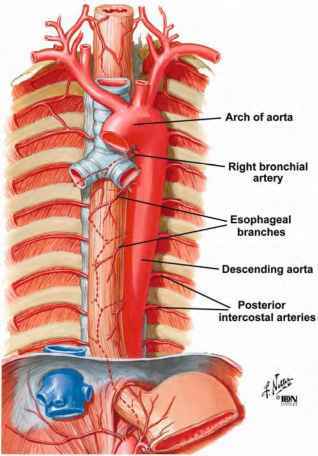 that attached to the chest and a gauge that helped evaluate the force needed for effective compression and decompression, thus creating a vacuum within the chest (Fig. 1A). 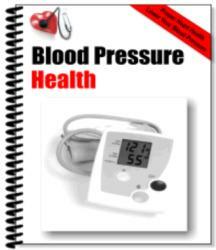 It is considered that the vacuum draws more blood back into the heart, which then results in more blood flowing out during the subsequent compression. However, it is also considered that air drawn into the lungs during a decompression can in turn reduce the volume of blood that can be drawn into the heart. Therefore, employing an impedance threshold device can minimize this situation. The impedance threshold device is a small, 35-mL device that fits on a face mask or an endotracheal tube (Fig. 2). Its pressure-sensitive valves limit the inflow of air during chest decompression, allowing more blood to come into the thorax area (10). Initially, in an animal study, Lurie et al. (11) showed an increase in blood flow to vital organs in animals eliciting 6 min of ventricular fibrillation and then 6 min of standard CPR plus the use of an impedance threshold device. Today, most emergency medicine service units utilize a multitier response system, with emergency medical technicians (EMTs) providing basic life support services, backed up by paramedics if advanced life support is needed. All of these personnel are trained in the use of automated external defibrillators. There are several companies that produce such devices, and their availability is no longer limited to hospital or emergency services settings. Yet, such units may also have expanded features that not all individuals are sufficiently trained to utilize. For example, the LIFEPAK® 12 defibrillator/monitor series, manufactured by Medtronic, Inc. (Minneapolis, MN), allows the recording of a standard 12-lead ECG even in remote locations (Fig. 3). Nevertheless, with the same equipment, various personnel with different levels of expertise and training can provide lifesaving support, for instance, some units have even incorporated push button turn controls with voice prompts. To date, devices such as the LIFEPAK 12 defibrillator/moni-tor series give paramedics access to sophisticated diagnostics and treatment in the field. This single piece of equipment monitors the ECG continuously, measures the level of oxygen in the bloodstream, and if necessary, provides defibrillation or pacing to help maintain the heart's rhythm. Thus, it allows paramedics to perform computerized 12-lead ECGs before the patient reaches the hospital. Such ECG data can be transmitted by cellular phone to the emergency room physician from the ambulance while en route. With this information in hand, the team of doctors and nurses can be ready and waiting for the patient's arrival; importantly, they can administer treatment in as little as 15 min after the patient enters the emergency room, compared to an hour or more if the ECG is first done at the hospital. It is generally considered that any shortening of the time to treatment can significantly speed recovery and improve a patient's chances of returning to a fully productive life. Fig. 4. The Bio-Pump was originally developed for cardiopulmonary bypass, but it can be used for short periods of circulatory support (usually 5 or fewer days) beyond the surgical setting (Medtronic, Inc., Minneapolis, MN). The Bio-Pump has been used both in postcar-diotomy cardiogenic shock patients (those who have developed heart failure as a result of heart surgery) and as a bridge to transplantation for patients who cannot be weaned from the device. This short-term assist device can be implanted in a broad range of patients, from new-borns to adults, and can be used alone or with another Bio-Pump or other type of assist device if biventricular support is needed. The BioPump is an extracorporeal, centrifugal device that can provide support for one or both ventricles. Two disposable models are available: 80-mL model for adults and 48-mL model for children. 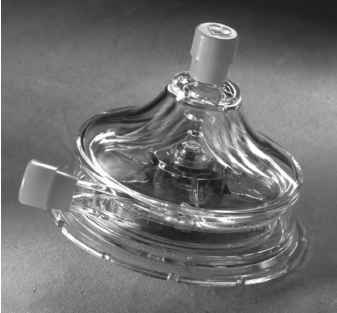 The transparent pump housing is shaped like a cone. The pump consists of an acrylic pump head with inlet and outlet ports placed at right angles to each other. The impeller, which is a stack of parallel cones, is driven by an external motor and power console. Rotation of this impeller at high speeds creates a vortex, which drives blood flow in relation to rotational speed. Blood enters through an inlet at the top of the cone and exits via an outlet at the base. The adult model pump can rotate up to 5000 rpm and can provide flow rates of up to 10 L/min. By the time a given patient had arrived at the hospital, the symptoms had subsided, and the ECG in the hospital appeared normal, yet the attending doctors compared the ECG done in the ambulance with the one obtained from the patient's physical exam a month prior and then there was no question about the diagnosis, a progressing heart attack. With 12-lead ECGs on board, an ambulance becomes a mobile clinic and paramedics become the doctors' eyes and ears. It is likely that more and more computerized data collection (e.g., pressures, flows, etc.) will be performed by paramedics or others prior to a patient entering the hospital setting, which will then be seamlessly integrated with the hospital's electronic database to create a complete picture of a patient's medical condition from initial contact all the way through hospital discharge. Many such developments are currently available, and the challenge for health care providers in the coming years will be to provide the best possible care in the most cost-effective way.